While there are more winter days ahead, now is a perfect time to begin planning a school garden. In this issue, three dynamite members of the Minnesota School Garden Coalition—Kirsten Saylor, Carrie Stowers, and Lori Murphy—write about the benefits of school gardens and invite you to the annual Minnesota Schoolyard Garden Conference to hear from programs like the Green Thumb Initiative and Crossroads School and Vocational Center. 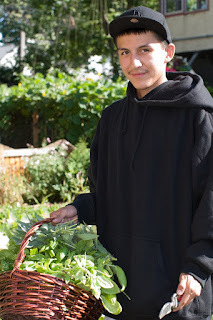 A school garden is an outdoor classroom where students discover where food really comes from. It is a method to explore different educational content areas, and meet education standards in a hands-on, culturally responsive way. Schools have used their gardens for project-based work, community engagement, and to apply math and science concepts. They have also used gardens as an outdoor classroom, to "team teach with nature," and for discovery of shapes, colors, and sizes. Through the garden, they can become tangibly acquainted with social studies by growing and utilizing plants from specific cultures, and expanding their universe of edible fruits and vegetables. The garden provides a "hands-in" learning laboratory to develop 21st century skills of inquiry and critical-thinking, collaboration, communication, and creativity. School gardens bring learning to life—literally! They play a key role in connecting students to where their food comes from. Farm to school efforts, like school gardens, open the door for farmers to connect with students, and for students to connect with the work that is needed to grow food. Inevitably, they will see plant disease and oddly-shaped produce, and learn that while some produce might not make the grocery shelf because it is blemished or doesn't fit our ideas of what it should look like it is still good. Parents and studies alike testify that when students grow it, they are more likely to try it. Holding the harvest in their hands or seeing their plants growing, students gain a sense of pride and accomplishment of doing something meaningful and relevant. Through school gardens, students build greater appreciation for the people who grow the food we eat and the efforts it takes to bring it to the table. School gardens help students ask questions about our food system and the multiple efforts it takes to make food available on our kitchen tables. The Minnesota Landscape Arboretum and University of Minnesota Extension Master Gardener Volunteer Program, in collaboration with the Minnesota Schoolyard Garden Coalition, host an annual Minnesota Schoolyard Garden Conference. You are you invited to see the School Garden community in action on Friday, March 2, 2018. Come celebrate how the school garden can enrich academic learning and enhance food skills among students of all ages! To register or learn more about the conference, visit arboretum.umn.edu/Schoolyards2018.aspx. Come to the conference and hear from programs like the Green Thumb Initiative in Rochester. Watch this video to learn more about their program that uses project based learning. Or, the Anoka County Master Gardener volunteers who work at Crossroads School and Vocational Center in St. Francis, Minn. Watch this video about their program and Extension Master Gardeners. For information about school gardens and help connecting with others in your area, contact the Minnesota School Garden Coalition at mnsgcoalition@gmail.com. In-person help can be found with your local Statewide Health Improvement Partnership (SHIP) coordinator, Extension educator or Master Gardener volunteer. Check out the school gardens section of Minnesota’s Farm to School website for additional resources.